Anak Agung Niang Rai died on 14 May 2011 due to complications of diabetes and a stroke. She was the third wife of the king of Ubud, Tjokorda Gde Agung Sukawati who died in 1978. 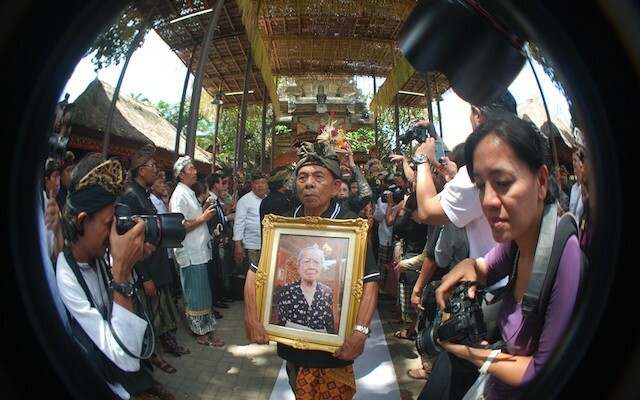 She was also the mother of the recent Gianyar regent, Tjokorda Oka Artha Ardana Sukawati. 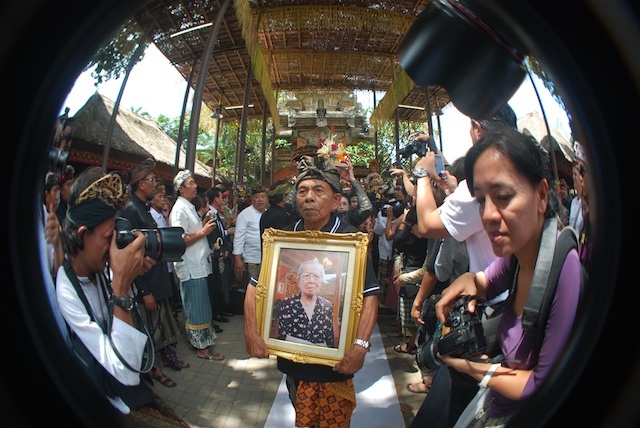 Since the day of her death, news about the upcoming great cremation ceremony or Ngaben in Puri Ubud spread around Bali and beyond. Ngaben or the traditional cremation ceremony of Hindu Bali is known as a very attractive cultural event. Therefore, many people wish to witness the rare occassion of a great cremation ceremony. It shows visitors a glimpse into the intricate cultural rites and traditions on Bali. Puri Ubud is a place where the family of the Ubud king has lived from generation to generation. 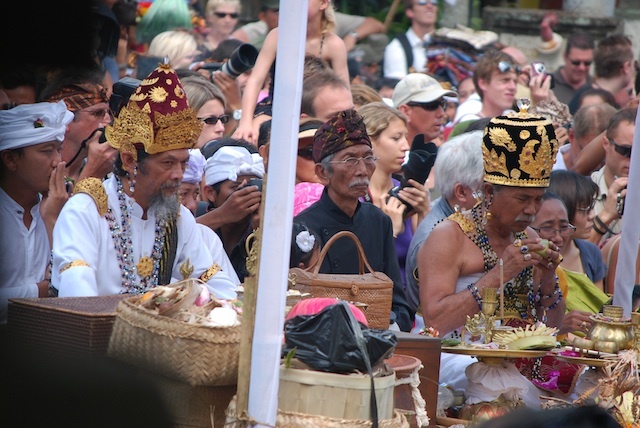 On 18 August, the Ngaben ceremony was held. 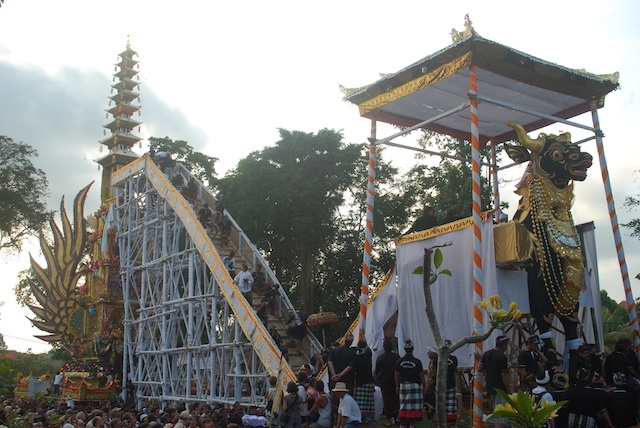 Thousands of tourists came to Ubud to witness the great event. Some guests who came to the cemetery were public figure like celebrities, family members of the other kingdoms in Bali and of course some local, national authorities and other important figures. As a result, the security of the event was very tight with hundreds of police men standing by. Fulfilling people’s expectation of the great event, the cremation ceremony was both spectacular and memorable. The event started at 1 o’clock at midday with some dance performances in Puri Ubud. A dramatically ornamented bade, cremation tower that houses the corpse on its final journey. It was measured an unbelievable 24 meters and weighed about 10 tons. The bade was made by Tjokorda Gde Raka Sukawati, the first son of Anak Agung Rai. Aside from the bade, the sculpture of a black cow called lembu was also created by Tjokorda Gde Raka Sukawati. The lembu was about 7,5 meters high. Starting from Puri Ubud, the bade with the corpse inside together with the lembu were carried to the setra or cemetery, a distance of about 900 meters. It took seven groups of about 300 people each to carry the bade in turns on the way to the setra. On the way to the cremation ground, certain precautions must be taken to ensure that the deceased’s spirit does not find its way back home. Loose spirits that are caught in between two worlds can be a real nuisance. To make sure this doesn’t happen the Balinese try to confuse the spirits as to their whereabouts, by shaking the tower, spinning it around, throwing water at it, resulting in the last journey of the deceased in being anything but a stiff and stately affair. In general, cremations are regarded as a festive occassion, where the soul of the deceased gets to return home. When the bade arrived at the cemetery, a ceremony took place lead by the priests in Hindu Bali. 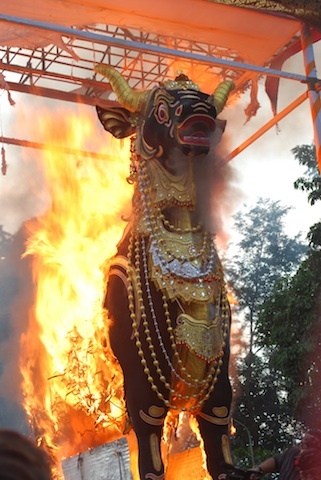 After some rituals, the bade, with the body of the empress and lembu were set alight. The spectacular sight of the flames signal the end of the princess’ earthly existence. Then, the ashes were taken by the family and spread in the ocean. Ngaben in Hindu Bali is meant to separate the soul from the human body. To accomplish this separation, the body needs to be cremated. Ngaben ceremony for men and women are different. In ngaben ceremonies for women, there is no naga banda or statue of a dragon. Before the great event of Ngaben, the family usually passes through a series of rituals. Cremations in Bali are extremely important but also very costly. Poorer families might resort to burying their loved one for a number of years before they have enough money to hold a cremation (sometimes several people are cremated at once). In the end it is all worth it, because for the Balinese, the 5 elements that make up the microcosm of the human body have to be returned to their original residence, the universe’s macrocosm. The five elements, consist of the earth (pertivvi), water (apah), fire (teja), air (bayu), and ether (akasa). Since the primordial dimension can only be attained through water and fire, the ashes are dispersed in the waters of the ocean or in a river. Previous PostRamadhan and the sharing of love in my neighborhood Next PostLatitudes.nu 2011 Photo Contest: 'Transport, Transport'!